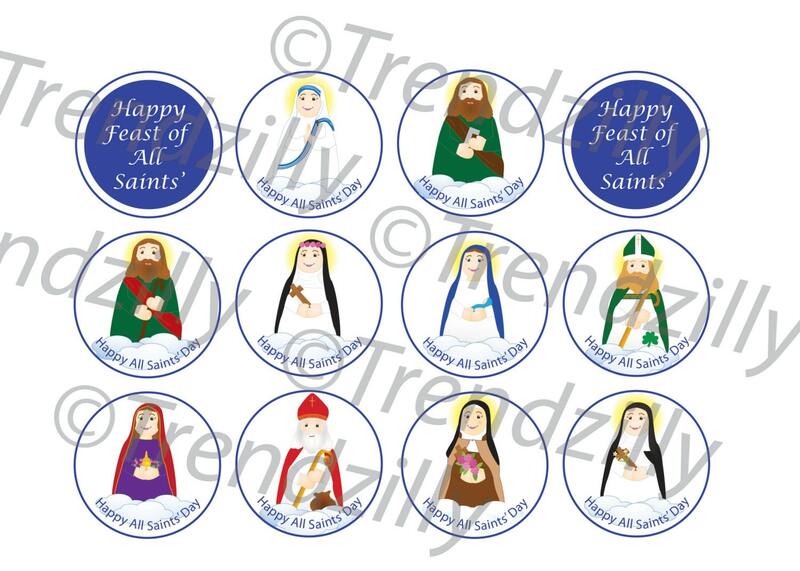 All Saints' Day Cupcake Toppers, Soft Saints Printable All Saints Day Cupcake Toppers, All Saints Printables, Feast Day Instant download. All Saints' Day Cupcake Toppers printable. Set of 12. Each topper is 2" round. ~ All Saints Cupcake Toppers, can be used as is printed on plain paper cut out or glued to construction paper or print on card stock and taped to a stick to place on top of your cupcakes. You can also use them to create stickers, gift tags and much more. A great way to help you celebrate the feast of All Saint's with your little ones. files can be downloaded after payment is confirmed. *Please note this is a instant download you must print, not a finished item. Color printer needed. Or can be saved to jump drive or CD and printed at any print shop. ***Downloads are for personal use only! Can not be sold or use in any way other than the intended use without permission. Thank you!